In the June 16, 2015 Ask The Headhunter Newsletter, an old friend re-surfaces… for a little while! The New Interview Instruction Book is BACK! 20 years ago, Ask The Headhunter was born from a discussion forum I started on Prodigy (does anyone remember Prodigy?) and a book titled The New Interview Instruction Book. The book was for sale only by mail order direct from me and from the Motley Fool, the personal finance site that hosted the ATH discussion forum — before I created the ATH website, newsletter and blog. 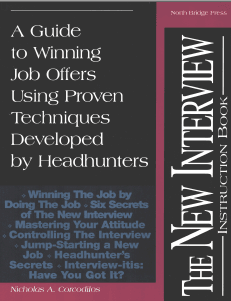 It was in The New Interview Instruction Book that I introduced the key concepts and methods that are still the foundation of Ask The Headhunter — methods for landing the right job by demonstrating that you can do the job profitably. The book was taken out of circulation when Penguin Putnam bought the rights and issued a revised edition named Ask The Headhunter: Reinventing The Interview to Win The Job (1997). That book became a bestseller, and finally went out of print a few years ago. Until now, neither edition has been available (except used). Now a limited number of copies of the original book are available until the supply runs out. Of course, a 20-year-old book has some anachronisms in it! But the concepts and the how-to are exactly what we discuss in this newsletter all the time — except there’s more how-to and much more detail! The methods in this book are just as valid and powerful today as they were in 1995! Please note that because quantity is limited, there are no returns or refunds on this book. In this edition of the newsletter, I’d like to reprint a key section of The NIIB: The Six Secrets of The New Interview (pp. 21-24). I hope you enjoy it! The Six Secrets of the New Interview are not really secrets, because every good headhunter recognizes these facts, and uses them every day. Insiders have the best shot at the job. The real matchmaking is done before the interview. The interview is an invitation to do the job. The employer wants to hire you, and he will help you win the interview. The boss wants one thing from you: he wants you to solve a problem. You will win the job by doing it. Let’s look closely at what the Six Secrets of the New Interview really mean. 1. Insiders have the best shot at the job. Other things being equal, the boss will hire someone he [or she!] knows before he hires someone he does not know. Why? Because he has more information about people he already knows, like other company employees, than he has about you. And, the information he has is more reliable. Part of a headhunter’s job is to build his candidate’s reputation within a company before the candidate goes on the interview. You can accomplish this for yourself, if you know how. In the sections that follow, we will discuss how you can make an employer perceive you as a valued employee rather than an outsider. 2. The real matchmaking is done before the interview. The work of matching a worker with a job takes place before the interview, not during the interview. You have heard it said that in a courtroom a lawyer never asks a witness a question to which the lawyer does not already know the answer. Similarly, a headhunter never sends a candidate to an interview unless the headhunter already knows the candidate can do the job. You must ensure the same for yourself. 3. The interview is an invitation to do the job. Most people treat an interview like an interrogation. One person asks questions, the other gives answers. This is wrong. Headhunters go out of their way to structure interviews to avoid this very unfavorable scenario. An interview is a meeting between you and the employer — you are equals. The traditional notion of the all-powerful interviewer and the deferential candidate is hogwash. Unfortunately, this notion is promoted each time someone says that a candidate was interviewed by an employer. The root of the word “interview” means between. “Interview” does not imply that one person is doing something to another. It refers to an exchange of information between two or more people. Specifically, it does not imply that the employer has power over you, the candidate. The only power either of you has is power you have each granted to the other. If you grant an employer the power to intimidate you and interrogate you under a hot light, then that’s your decision. Unfortunately, that’s what a lot of candidates allow to happen. Interviewers (and personnel jockeys) take advantage of it. There is one power you and the employer share. If you can capitalize on it, you will turn the interview into a decisive problem-solving experience that will make the employer view you and treat you like a member of his own team. This power lies in your choice to work together, with the employer, to get the job done. This means avoiding interrogations. It means doing the job in the interview. We will talk more about how you can put this power to work, and thereby avoid getting interviewed in the traditional sense. 4. The employer wants to hire you, and he will help you win the interview. This might seem absurd to some. It’s not. It is precisely why the employer is meeting with you. Every headhunter knows that. The headhunter counts on the employer being ready to hire the candidate. So should you. If the employer hires you, he wins, too. He can stop interviewing, and he can start earning the profits that having you on the job will yield. Give the employer what a good headhunter gives him: proof that you can do the work. He wants you to be the right candidate. Half your battle is won. No other single fact about interviewing ever made me more relaxed, comfortable and powerful in an interview when I was looking for a new job. 5. The boss wants one thing from you: He wants you to solve a problem. Every employer who interviews you has a problem: a job that needs doing. Most candidates don’t solve the boss’s problem because they don’t know what the problem is, and because they’re too busy “doing the interview”. That’s what keeps headhunters in business — job candidates who can’t identify and solve the boss’s problem. A headhunter makes sure his candidate knows exactly what problem he has to solve to win an offer. If one of your predecessors had proved they could solve the employer’s problem, the employer would not be talking to you. Ask yourself The Four Questions before you meet the boss. If you can answer them all “yes”, go in and do the job. How do you do the job before you are hired? Solve one or more of the manager’s problems during the interview. See what happens. 6. You will win the job by doing it. You will not win the job by talking about it. Managers end interviews with, “I’ll get back to you” when they can’t decide whether to hire you. That’s because they’re not sure you can do the job. What more compelling way is there to convince a manager to hire you than to do the job the way he wants it done right there in front of him? If you waste your meeting answering questions rather than doing the job, you will lose the job to another candidate who was well prepared to do the job. Good headhunters know these secrets and apply them all the time. They treat all interviews as practical meetings with a purpose, and the purpose is to show that a job candidate can do a job so that he or she will be hired. The headhunter devotes all his energy to achieving this purpose. I have shared these ideas over the years with job candidates I’ve sent to meet my clients. It is important for candidates to recognize how important they are to the employer. I want them to see interviews for what they are: opportunities for skilled people to demonstrate to an employer the best way a job can be done. These ideas will change your job hunt in some very important ways if you put them to work. You will be freed from the banality of the traditional interview. You will form a relaxed attitude about interviewing and develop the confidence and power a talented worker should have. You will blossom from a job candidate into the solution to a manager’s problem. I know I’m making you wait, but I can’t teach you how to use methods that work until you first understand why the rules drilled into your head by the employment industry are a waste of your time. In the next section we will look more closely at why traditional interviews don’t work. We’ll take a practical look at why companies use the traditional interview process, how they misuse it, and how this puts job hunters at a disadvantage. Understanding the problem will help you make the best use of the concepts presented in this book. Reprinted from The New Interview Instruction Book. This classic is available only while the limited supply lasts! These are age-old ideas for landing a job. When I wrote a book about them long ago, I didn’t expect I’d be discussing these ideas with you 20 years later! Do they still hold up? I think they do — mainly because thousands of you have proven it to me! Are there secrets of your own you’d like to add? This is a Q&A overflow area for attendees of today’s webinar Parting Company: How to leave your job on your own terms, presented to UCLA’s Anderson School of Management — students, alumni and faculty. 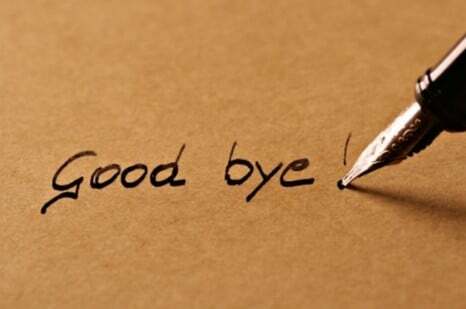 The webinar was based on the book Parting Company: How to leave your job. Many thanks to the team at Anderson for their kind hospitality, and to the audience for sticking around well past the end of the presentation — I enjoyed all your questions! If you have more, please feel free to post and I’ll respond to them all! In the February 3, 2015 Ask The Headhunter Newsletter, we take a look at how to leave your job without hurting your career. Fired? Downsized? Need to resign? How should I quit this job? 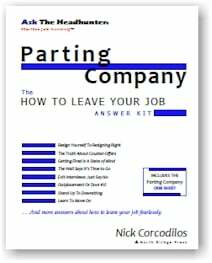 Although this blog is mostly devoted to Q&A — your questions and my advice — I’m going to take the liberty of using most of this edition to tell you about Parting Company | How to leave your job — a new PDF book that I’ve spent months preparing. I’ve gotten so many requests for a thorough Answer Kit about how to leave a job that I’ve produced this new 73-page guide that covers almost everything you could possibly need help with. Parting company is a trying right of passage — and it’s important that you know how to do it on your own terms. Resigning a job can be a stressful experience. Getting fired is far worse. But, on top of either, who wants to face a gut-wrenching exit interview on the way out the door? Suddenly, otherwise-confident people get clobbered by unnerving choices. You may have gotten fired or downsized, or you may be thinking of quitting — or perhaps you’ve landed a new job and you’re facing a confusing counter-offer from your old employer. If you don’t part company on your own terms, you can get hurt. I was recently let go without being given a reason. I believe it was because we had a disagreement. I felt my boss was too demanding and high strung, and he felt I was not aggressive enough. When I apply for jobs and they ask me what happened, what should I say? Don’t worry that you might turn an employer off by saying that. If you’re not compatible, it’s best to know immediately. Don’t avoid discussing the fact that you were let go, but check your personnel paperwork carefully. Did they actually terminate you, or did they ask you to resign? In Parting Company | How to leave your job, see the section titled “Getting Fired is a State of Mind,” pp. 12-14. The attitude you project can make all the difference. My goal with this new book is to help you make your next move successfully — and on your own terms! 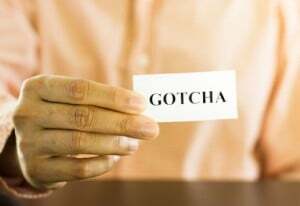 Included in Parting Company is a 7-page Crib Sheet: A checklist of gotchas to avoid as you prepare to exit your company for the last time. I asked some of my favorite HR managers (Yes, I’ve got friends who are good HR managers!) to disclose their insider tips — about what departing employees must do to avoid trouble later, and to make parting as gentle an experience as possible. You’ll learn things that until now you never even worried about — but should have! But I won’t leave you hanging after helping you move on from your old job. Parting Company comes with a BONUS MP3 — It’s “all the best stuff” distilled from a workshop I gave at Cornell University’s Johnson School of Management. A lecture hall full of Executive MBA students came to learn How to make contacts that can lead you to a new job! If you’ve enjoyed the How to Say It tips I sprinkle throughout Ask The Headhunter, you’ll love this short, tip-filled audio bonus. If you’ve subscribed to this newsletter for any period of time, you know that Ask The Headhunter is where you can come for answers — and not just answers you pay for when you buy a book. Every week, I welcome you to bring your questions, comments, stories and suggestions about the topics we discuss here — on the blog — where I do my best to offer advice about the unique problems and challenges you face. And, as a buddy of mine likes to put it…. Mo’ betta than that… you’ll get the insights and advice of the entire Ask The Headhunter community. 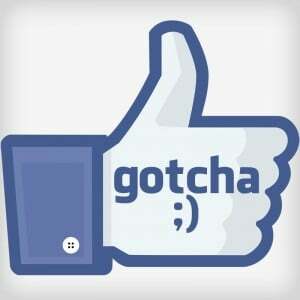 Like all Ask The Headhunter PDF books, Parting Company | How to leave your job comes with a 7-day full-refund guarantee. Got a question about something that’s not in the book? Post it to the blog and we’ll all do our best to help you. 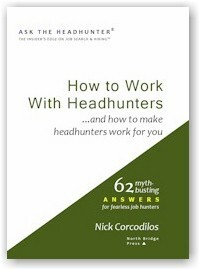 If you try Parting Company, I’d love to know your reaction to this new 73-page Ask The Headhunter Answer Kit! Are you facing a downsizing? Getting fired? Moving on and need to resign? What’s your specific issue or problem? Post it, and we’ll discuss it — and share the entire community’s great advice and suggestions! Last fall I was tickled to publish the first guest author in the Ask The Headhunter Bookstore: Dr. Erica Klein, who wrote Employment Tests: Get The Edge. The book stemmed from enormous interest in a short article Erica wrote for the Guest Voices section of the Ask The Headhunter website. I asked Erica to turn it into a book, and boy, did she! Following a recent spirited discussion I had with Erica, she came back to me with a list of her concerns about employment testing — concerns that I think every job hunter who has ever faced such a test has, too. She’s turned her worries into a great article that serves as a companion piece to the book — and she asked me to publish it as a way to help job seekers deal with three more daunting obstacles they’ll encounter when employers want to test them. You may read her full article here: An Insider’s Biggest Beefs With Employment Testing. It’s housed in the Guest Voices section of the website, but I wanted to share with you here the gist of her three biggest beefs — because I’d love to have a discussion about your comments and experiences with employment testing. My #2 complaint about pre-employment testing is lack of “face validity.” Face validity is a subjective judgment the test taker makes about at test, not a quality of the test. A test is face valid if it appears to be measuring what it is actually measuring. Since pre-employment tests are always measuring and predicting attitudes, behaviors and knowledge related to work, the test is face valid when it asks questions related to the work. For example, in my opinion, face-valid pre-employment tests should not be asking about how you act at parties, your personal life, whether you take the stairs two at a time (I’m serious: this is a famous, real test question!) or anything that does not appear to be related to the work. Employers have an obligation to use tests that are good at predicting success, and you have a right to expect that any test you take will indicate your chances of doing well at a job. As a job applicant, you might find it difficult to tell bad tests from good tests — especially given that not all good tests will look like what you think they should (see complaint #2). Dr. Klein goes on, in the article, to suggest what you can and should do to protect yourself in these three key testing situations — because it could have a significant effect on the outcome of your testing — and job application — experience. Please read her tips — and come back here to share your thoughts! 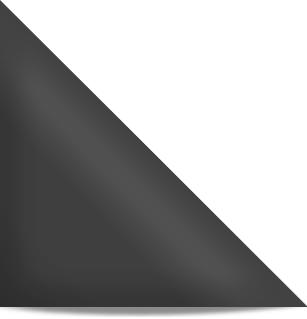 Employment Tests: Get The Edge | NEW BOOK! I’m going on an interview shortly. I was told that prior to receiving an offer there would be some testing. I doubt there are any tests that relate to the job content of this particular job. What other kinds of tests are typically given, and what should I look out for? Employers routinely administer tests without notifying candidates what tests they’re going to give them. That’s not acceptable. You should ask the employer in advance exactly what tests will be administered to you. Employment testing is a complex issue — there are ethical, legal, and practical considerations. I’ve got my own opinions, but I turned to an expert in employment testing for help in answering your question. Erica Klein is a Ph.D. Industrial Psychologist who has worked in the field of strategic, competency-based selection and assessment since 1998. She develops and administers employment tests, and she’s taken virtually every kind of employment test herself. Dr. Klein explains that, when they’re administered appropriately, “Tests can help employers predict who is likely to be successful in a job. In combination with interviews and experience and education screening, tests can provide employers with additional predictive value.” In other words, such tests can actually help you land the right job and avoid the wrong one. 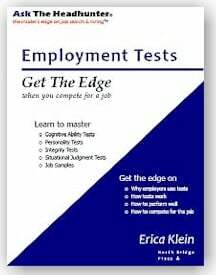 Klein is also the author of Employment Tests: Get The Edge — a new PDF book from Ask The Headhunter. Dr. Klein steps out of her normal role interpreting research for the benefit of employers, to advise job seekers who take tests. An article Dr. Klein wrote for the ATH website has been so popular that I asked her to write this 36-page PDF book for the ATH bookstore. It’s the only book that you’ll find that covers all 5 major types of employment tests — written to help job seekers. 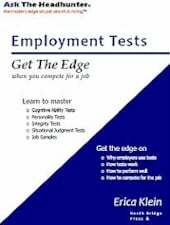 Order Employment Tests: Get The Edge now! My concern is where a test comes from, because few employers actually create their own. Know your rights. You don’t have to take a test, but if you don’t you will probably not be considered for the job. Learn as much as you can about the tests you will be taking so you can perform your best and avoid common mistakes. Approach testing like an athletic event with proper training, rest and nutrition. Ask for feedback about your test results. Use the results to learn more about yourself and refine your job search. Clearly, it’s up to you to ask questions and to do your own homework. But you’re not alone. The American Psychological Association (APA) has established stringent codes regarding the administration and interpretation of such tests. These codes dictate that the tests must be valid and reliable, and the results of the tests must be properly interpreted and shared with you. So, don’t walk into a testing situation blindly. If you want to perform at your best, you need to know what to expect, and you should prepare in advance. If a company doesn’t abide by the APA rules, I’d decline to be tested. 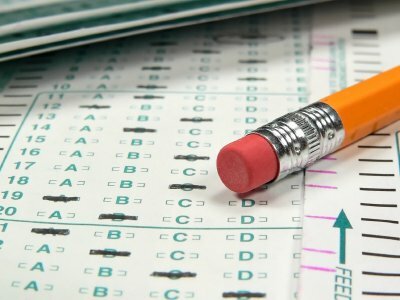 You’re not back in grade school, where tests are forced on you. You’re an adult, and you are not required to take any test unless you want to. You also need to know whether and how the results will be stored — it’s a privacy issue. If you’re uncomfortable, ask questions before you consent until you are satisfied the testing will be conducted properly and how it will be used to judge you. While some companies administer tests in ethical, appropriate ways, others have little idea what they’re doing–and that puts you at risk. Before you let anyone poke and prod at your personality, make sure you understand the potential consequences. All job hunters should visit the APA’s website to learn about their rights: Rights and Responsibilities of Test Takers: Guidelines and Expectations. Did you know you have rights when it comes to employment testing? How do you prepare for employment tests? Do employers explain to you the tests and testing procedures in advance? Has your performance on a test ever cost you a job opportunity? I need a template for a two-page resume that will help me get in the door at a company I want to approach. Can you help? Resumes are a weak, passive way to get in the door (or to represent yourself). Using a template or any kind of boilerplate to demonstrate your value to a company is the worst thing you can do to yourself when job hunting. The resume needs to be tailored to the specific employer and job. That’s why job hunting isn’t easy — and it’s why you need contact with the employer first. Obviously, we’re no longer talking about resumes as a “marketing tool” but as a tool to prove you can do a specific job. This essentially voids your question and puts us into a different ball game. I never said I’d support the mindless use of a resume; just that I’d give you my suggestions. A resume can’t answer questions (especially if it’s muffled under the weight of 5,000 other resumes sitting on top of it). And a smart manager will be full of questions. This is why I don’t like resumes as a job hunting tool. (See The truth about resumes.) I’d rather go straight to the hiring manager and have a talk with him — but only after I’ve done my research so I can demonstrate how I’m going to bring profit to his bottom line. The magic words are not in a resume. How does anyone get to that manager? Well, it’s sort of a Zen thing. You can’t approach the manager until you have something useful to say to him. Heck, you don’t even know who he is. So do all the necessary homework. Talk to people who know the industry, the company, its business, the department, and other employees. Follow this trail to talk to people who know the manager. You’ll learn a lot. And that’s how you’ll identify and meet the manager, too — through people he knows. The big bonus: After all these dialogues, you’ll know a lot about the manager’s business, and you will actually have something to say that he will be eager to hear. 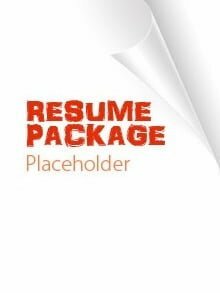 Where does a resume fit into that? Why waste your time trying to figure it out? Why submit a resume when the research you must do will put you in front of the hiring manager? Get In The Door (way ahead of your competition) is one of my 9 new Fearless Job Hunting books. It’ll take you where no resume can and get you there in person. Do you rely on a resume to get you in the door? Does it work? What do you think makes a hiring manager invite you for an interview? I follow all the proper steps throughout my job search, and inevitably I hit a snag that I don’t expect. Getting a job is portrayed as this system everybody follows — employers, job hunters, personnel people, recruiters. But the truth is, even if I do what I’m supposed to do, it just blows up in my face. I do my part, but employers drop the ball. It seems the salary range fits me, but then I find out it doesn’t. I’m ready to answer all the questions they could possibly ask about the job, and they throw me some stupid curveball! At the end of the interview, they promise an answer next week, but next month they’re still not returning my calls. No matter how prepared I think I am, there’s this nagging fear that around the next corner is yet another surprise that’s going to blow up in my face. How is anyone supposed to use this system to get a job? I’ve been burning the midnight oil, working on Fearless Job Hunting, a brand new set of 9 PDF books — the very best myth-busting answers from 12 years’ worth of ATH newsletters. But it’s not just reprints of Q&As. I’ve re-written, edited, enhanced, and beefed up each Q&A. I’ve added sidebars, articles, and extra examples. I’ve created How to Say It tips. Each book delivers my very best insight and advice on the 9 toughest topics you keep asking about. So let’s get on with this week’s Q&A — and then I’ll explain how Fearless Job Hunting will help you ovecome the daunting obstacles that stop other job hunters dead in their tracks. I’ve been saving your question for this special edition of the newsletter, because there’s no simple answer to it. The solution starts with an attitude and a strategy for landing the job you want — but it’s not in this week’s newsletter. Please click here for my advice about How to start a job search. 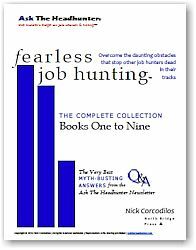 What you will find is a sample section from one of my 9 new PDF books in the Fearless Job Hunting series — Book One: Jump-Start Your Job Search. I hope this sample — How to start a job search — helps you orient your job search so you can stop fearing those curveballs. I’ve published almost 500 editions of the Ask The Headhunter Newsletter, and I get lots of requests for reprints of old editions about the toughest job hunting obstacles. The question in today’s newsletter merely highlights what troubles job hunters: The broken-down employment system that every day fails employers and job hunters alike. Success in job hunting isn’t about chasing job postings, sending resumes, and filling out endless online application forms. If any of it worked, you’d have the job you want. It’s not a step-by-step “process” for landing a job. There is no such process that works! If you’ve been participating on Ask The Headhunter, you know exactly what I mean, because it’s what we discuss every week! In the real world, “the steps” lead to failure when you encounter daunting obstacles — the inevitable obstructions that trip you up. Either you know what to do to overcome them, or you lose. A personnel manager rejects you. A friend gives you a contact. An employer wants your salary history. It’s between you and Candidate #1. You received an offer, but a better one is pending. The first employer wants an answer now. The interview went well, but they’re not calling back. How you cope with these obstacles will make or break your job search, no matter how good your resume is, how clever your interview answers are, or how many jobs you’ve applied for. Learn how to be more assertive and how to maintain control in today’s insane job market. Be fearless. 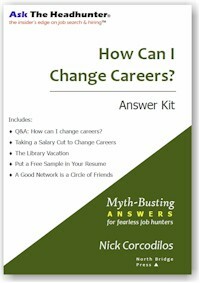 Dive into your job search armed with myth-busting methods to deal with the most daunting obstacles. Get the Ask The Headhunter edge, and say hello to total control over your job search. Think about the handful of “hit the wall” challenges I’ve listed above. Then please share your experiences: How have you dealt with one or more of them? Let’s compare your methods with some of the tips I’ll discuss from the 9 new Fearless Job Hunting books. And don’t miss the sample section of Jump-Start Your Job Search! Fearleass Job Hunting™ is a trademark of Nick Corcodilos. Should I disclose my salary history? You’re absolutely right — to a point. When you show your salary cards at the wrong time, your negotiating edge disappears. When employers ask for salary requirements, they usually follow up quickly with a question about your salary history. Then they use your last salary to limit any offer they make. And that’s why you need to take control of the discussion. You should avoid disclosing your salary history, while expressing your desired salary as a range you can justify and defend. The best way to negotiate a good salary deal is to demonstrate that you’re worth it. In my opinion, discussing salary history is a no-no. It’s no one’s business. Some employers will object, but keeping your past salary confidential is pure common sense because it directly affects your ability to negotiate. Although an employer may suggest that your old salary is a good indicator of your value, the truth is that it’s up to her to make an independent assessment of your value to her business. Your salary is nobody’s business. Disclosing it can cost you a big raise. Learn to say NO firmly and with authority when employers demand your salary history — to make them say YES to the best possible offer. BONUS: I’m throwing in a special mp3 download, from my recent workshop at Cornell’s Johnson School of Management. ORDER NOW! Get a BONUS mp3 download! Don’t cap the job offer. Employers claim otherwise, but once they know your salary history, they’re likely to use it to limit any job offer they make to you. They offer myriad excuses for why they need to know your salary, but I’ve never heard a legitimate one. (My favorite: “It’s the policy!” Gimme a break.) If they want to make sure you’re “in the right ballpark,” ask them what the salary range on the job is. If they continue to press you, ask yourself whether they’d disclose the boss’s salary — or anyone else’s salary in the department. Makes no sense, does it? Don’t help an employer cap the job offer by retreating to your old salary before you even begin to negotiate. Turn any salary question around and ask what exactly the employer wants you to accomplish for her business. Then be ready to show how you will deliver. If this sounds like a lot to prepare in advance, it is. If you can’t do it, then you have no business in the interview. It’s legitimate for an employer to ask what you want, as long as it’s couched in a larger discussion about how you will contribute to the bottom line. As we said above, the more value you can contribute to the work, the more you’re worth. There’s no way to provide a desired range until you know what the job entails and what the expectations are — and that requires thoughtful discussion about the manager’s business objectives and how you will fit into them. Salary negotiations can be challenging. But it’s easier to negotiate the right deal when you’ve demonstrated good faith — and firmness — by keeping your salary history private, by demonstrating your worth, and by sharing your goals with the employer. 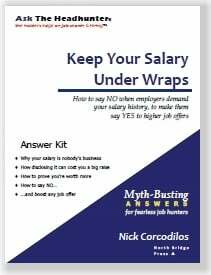 How to handle demands for your salary history is such a hot topic on Ask The Headhunter that I wrote a 27-page Answer Kit that teaches how to say NO politely and with authority, so you can prove you’re worth more: Keep Your Salary Under Wraps! How do you protect your ability to negotiate the best salary? Should employers demand your salary history? Should you disclose it?